a view of the Bass River. Upstairs, there is a full bathroom w a tub/shower combo. All ceramic tile, floor to wall, was done in 2000. The small bedroom w 2 twin beds and an ac is next to the bathroom. The second bedroom has a queen pillow top mattress, a/c, electric fireplace, flat panel tv, dvd, cable and a view of the water from the picture window above the fireplace. The mattresses were purchased in 2015. The large beach is just a quick 5 minutes to the West Dennis Beach. This beach has the warm Nantucket Sound water, some waves and soft white sand. The Lighthouse Inn has a great menu on the beach. From the cottage, take a walk to the Breakfast Room for breakfast, Steamer Trunk's surf stuff shop, and the Christmas Tree Shop. An antique shop on the way is always fun to pop into. Location is central to all cape cod has to offer. This property has the use of all amenities at the Yarmouth Country Cabins just 8 minutes away. There is a heated pool, laundry room and bikes to borrow at the cabins. Kayak rentals are nearby the Tom Thumb. The Tom Thumb Cottage is a quaint waterfront cottage with an amazing view and sunsets on the patio every night. Convenient to shopping on Rt.134 at Patriots Square. Cape Cod Rail Trail is one mile from the cottage. There are bikes to rent, parking and one of our favorite restaurants, Morrelle's. The cottage has a dock and beach for fishing and swimming. A 185' dock and boat slip was built Sept '09. Boat slip available with rental. This cottage has 3 a/c units. Each bedroom has a/c and the living room has an a/c. Grand Cove is a Cape Cod Treasure! It is an amazing fishing spot. When the birds come flyin' in..the fish just start jumping! Sit back and enjoy the views of Bass River. This is a no wake zone. Very quiet. Mussels in the sea grass or fresh fish for dinner? Sail, kayak, and swim! Sit back and enjoy the sunset over the water every night from the patio. Light up the Weber grill for an evening fire or BBQ. The gas fireplace in the living room will keep you warm on a chilly Spring or Fall evening. The location of this rental is set in the heart of all that Cape Cod has to offer yet it is quiet and secluded. This is a Cape Cod treasure. A kayak rental (with delivery) of a kayak can make your vacation complete. Walk to the Breakfast Room for Breakfast or Lunch. We hope you will love it here as much as we do! 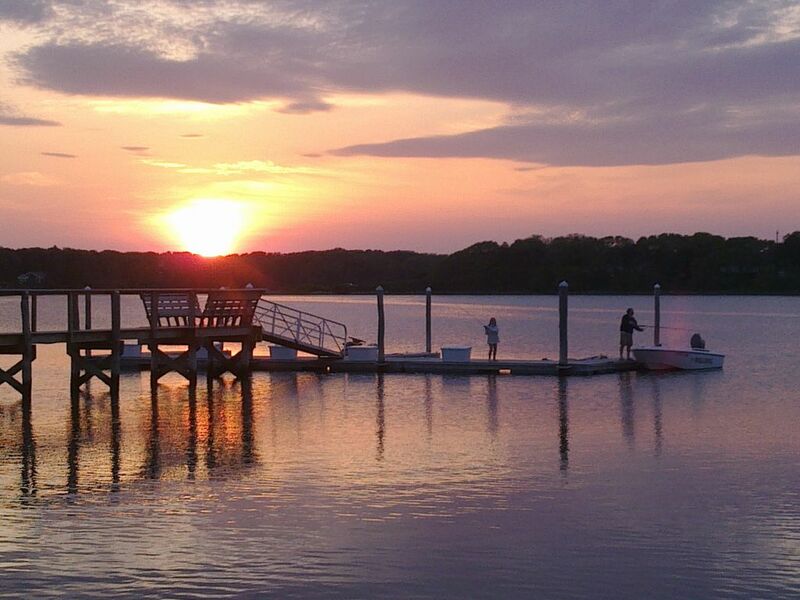 The Bass River Marina is just a few minutes away if you would like to rent a boat/boat slip for your week. Grand Cove is a No Wake Zone. Photos of the waterfront are taken from the back door. Grand Cove is ocean fed salt water. This cove is located on Bass River. Bass River connects to the Nantucket Sound. The water is the temperature of the ocean or a bit warmer and the fishing is bountiful. There is a boat ramp located on Great Wastern Road in Dennis. The ramp is about 8 minutes from the cottage and parking is free. Beaches: Chapin Beach/Mayflower Beach on the Bay side off Rt. 6a is so beautiful at sunset. Pack a picnic dinner. During the day, bring the kids at low tide...the beach goes out for miles with an abundance of tide pools. West Dennis Beach is just 2 miles from the cottage. It has just enough waves. Coastguard Beach: A 40 minute drive, big waves and nature. Seagull Beach in Yarmouth is calm and warm. Only 10 minutes away. Chapin Beach and Mayflower Beach are best experienced w a low tide that leaves a beach of about 3 miles out and tide pools for toddlers to play in. Resturants everywhere and shopping. Be sure to catch a whale watch. Cape Cod is a whales destination to feed before they make the trip down the east coast for the winter. Call or email us to reserve your family vacation at Tom Thumb Cottage. This location is so rich in nature. Sunsets, sea life, beach, central location and great owners that will help you if you need anything during your stay. Renovated. Tiled bathroom brand new in 2001. Located on the second floor at the top of the stairs. Tub/Shower fiberglass unit replaced in 2001. First aid supplies under the sink for your use. Enclosed hot/cold shower outside on the patio. West Dennis Beach is one mile away. There is a view of the public beach from the patio of Tom Thumb Cottage. There is a small public beach 100 feet away from the cottage. Town of Dennis Beach is named "Heckmann Road Beach". The cottage is located on the edge of Bass River that is ocean fed, salt water, tide occurring and great fishing. There is so much sea life for young children to experience. The cottage is located on the bank of Bass River. This river is an ocean fed, ocean access, salt water, tide and ocean marine life. A gas fireplace and an electric fireplace keeps the cottage toasty warm. gas fireplace downstairs in the living room and electric fireplace upstairs in the bedroom w a queen bed. password on the back of the router on the fireplace. Fully equipped with pots, pans, dishes, glassware, small and major appliances. No Towels provided. Towels can be rented by the basket (10 bath towels,10 face cloths, 5 hand towels 3 kitchen towels) for $25 a week. The heated pool and laundry are at the Yarmouth Country Cabins that is only 8 minutes away by car. Kayaks/canoes can be rented just a short walk away at The Steamer Trunk in Dennis. I believe they deliver. Also, just a short walk away is The Breakfast Room for a great morning breakfast or lunch. Contact me anytime with questions about Cape Cod or the area. I am happy to help make your visit on cape cod enjoyable. Quaint, cozy and comfortable! The fireplaces made this place fantastic for our off-season stay here. Absolutely loved it and can't wait to come back! Only thing I might recommend is more secure locks on both the front and side doors. Thanks for our stay, look forward for a repeat booking with you in the Spring. We stayed 3 nights mid-October at the Tom Thumb cottage and it was perfect. The photos for the listing don’t really do it justice. After a long drive we walked into a clean, fresh, toasty warm cottage with parking right out front. Lovely to watch the ever changing riverview, the fireplaces added a comfy vibe and the kitchen had everything needed for simple meals. The cottage is set back off the road but only minutes away from a good grocery, take-out seafood, a nearby beach and a great dog park with a fresh water pond and woodland trails. Easy day trips hanging out in Truro and Provincetown. Really comfortable queen bed, plenty of hot water and quiet; high season might be noisy as the cottage is right next door to two other cottages. We’d book again but our 10 year old dog had difficulty on the switchback staircase with bare floors: she needed more traction and couldn’t navigate the tight turn. It’s a shame because the cottage is super convenient and comfortable for a couple with dogs or two children. Might be a bit tight for four adults. The manager, Audrey, replied quickly to our booking request and we had no issues bringing two 75-100 lb dogs (who are really well behaved and experienced travelers 😊). Good price, comfort, convenience and a view for a long weekend at the Cape. Beautiful waterfront and cozy cottage were wonderful! We loved this cozy and quaint cottage overlooking the Bass river cove. We enjoyed watching wildlife and kayaking without getting in the car. We enjoyed the fireplace on chilly evenings. We were able to get around the Cape from this spot as well. We will definitely want to return to this spot the next time we come to Cape Cod! I would love to give a great review, but… The location on Grand Cove is absolutely WONDERFUL! We fished for bass and blue crab right off the pier, the sunsets are magnificent, and the overall outdoor area is fabulous. We stayed for 10-nights, and I would highly recommend this area of Cape Cod to others. The actual rental is terrible (sorry). Not only is it tiny, BUT everything is just barely ok. The AC in the master bedroom works, but it’s so terribly LOUD you can’t possibly sleep while its on. The shower works, but the shower curtain does not cover the full tub so you have to be very careful to keep the water in the tub. The refrigerator works, but runs constantly. The oven works, but takes 25+ minutes to heat to 350-degrees. The venetian shades open and close, but not all of them have the cord stoppers in place, and what happened to us is the wind hit the window causing the shade to drop, and we could no longer close the shade as the cord disappeared. There are water stains all over the kitchen ceiling, some on the master bedroom ceiling, and mold under the kitchen sink. When you turn off the water in the kitchen sink, the water lines are directly under the house and make a terrible racket. The stair railing is rackety. Huge chunks of moldings on the ceiling are missing, the furniture is old and it is just tacky. Everything feels in disrepair and held together by Band-Aids. Sad really. This review is very sad amidst many that are very nice. I would like to document that NONE of these issues were brought to our attention during your stay. We would have gladly brought new ac, fix any leaks or fix anything within our power to do during your stay. Sorry the cottage was not to your expectations and will take all you have listed under review for next year. This is very unfair to do to an owner. You could have called or text us and we would have been there to help. Very beautiful-very very clean on the water- everything perfect!! I ca t say how happy we were that we picked this property... the house is small, so it is good for three adults at most, four would be difficult- but it is charming, very clean, amazing views of the water, the water was gorgeous-used the outside shower every day- the owner was exceptionally responsive to any concerns we had- the nearby houses were lovely- dennis is wonderful!! I cannot imagine staying anywhere else bc this house offered so much!! Walking on- 1mile from the house. Great restaurants nearby, kayack rental nearby! Honestly we could not have been any happier. Everything was already in the house- iron/ ironing board, coffee pot, bathroom was sooo clean everything. Was perfect! Nearest boat ramps: Highland Rd, Dennis Dennis Marina rt 28 Dennis. cottage includes wifi, stocked kitchen, linens and grills does not include towel and paper products dock is shared among the 5 cottages along the water the beach is a public, town owned beach dumpster on site for trash, sorry no recycling outlet if you need maintenance, additional housekeeping or have general questions, please call Audrey 6176403054 All nightly and weekly rentals; a cleaning fee applies. A good family pet is considered. A $75 charge for each pet and a cleaning fee of $125 This rental does not have a room tax or sales tax. Boat Slip + Dock box rental fee: $30.00 per day. Pets are expected to be leashed, frontline applied one week prior to arrival and groomed. Pets are allowed on the beach and the water with out a leash. There is a dirt path for walking your pet. Please pick up after your pet. Manager near by to help with any issues that may arise during your stay. Cancellations: No refunds for early departures or cancellations. If the cottage is re rented for your dates, we will refund up to 50% of the rental fee paid. All fees for pet, cleaning and dock will be refunded 100%. Towel rental fee is $25. No towels are provided without the rental fee paid. Linens, blankets and pillows are provided. We suggest that you bring your favorite pillow and 5 of your favs in the kitchen. For example: if you have a favorite chopping knife, skillet, pasta pot, griddle pan; bring them to make your meal prep easier. There are pots, pans, knives, etc; but they may not be as nice as yours... Gas grill provided and charcoal grill.